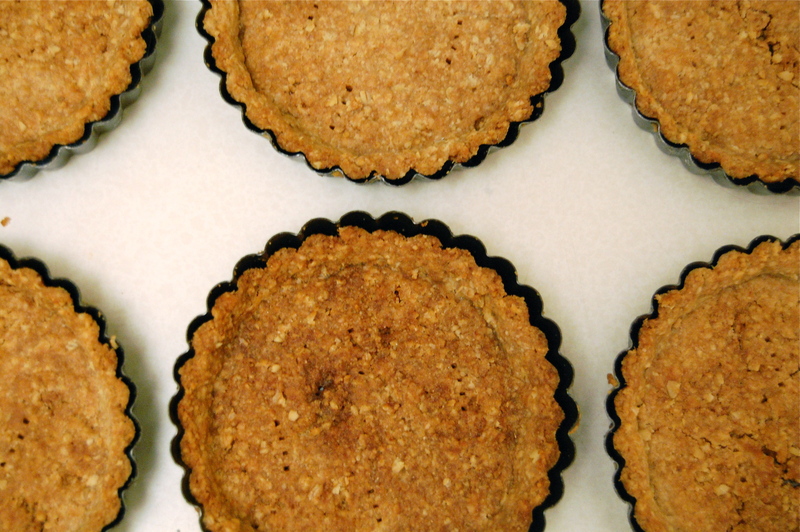 Well Hello, Cute Little Butterscotch Pudding Tarts | I made that! This one had me with the oat wheat crust. I know, not a typical starting point for feeling giddy about butterscotch, but I was so intrigued. Oats in a pate brisee? With brown sugar? And whole wheat flour? It sounded like a divine mess and I had to have it. I was so smitten that I even did the unthinkable (in my dough snobbery world), I pulsed the dough in the food processor. Sin! But I was feeling it. It was what the authors said to do, so I was trusting them. Just this once. And I have to say it was a little tricky. I err on the side of large butter chunks, and was nervous about pulverizing the beautiful oats. But this recipe doesn’t have a lot of liquid. Translation: if I didn’t incorporate the butter well, the dough would be dry. And it was. So here’s what I learned: Next time I will put half of the butter in the machine with the flour, sugar and salt. I will work that in really well to coat the flour. I will then add the rest of the butter and oats and just barely pulse those in to give me the texture I want. I will also use pastry flour next time, because I found the crust to be not quite as tender as I like. Since my dough was a tad dry, it was a bit of a pain to press into the shells, but I got there eventually. While the shells were relaxing in the fridge, I got to work on the butterscotch pudding. The other thing that made my ears perk up about this recipe was the pudding. Most butterscotch recipes just have you cooking brown sugar and butter until it takes on a caramelly flavor. 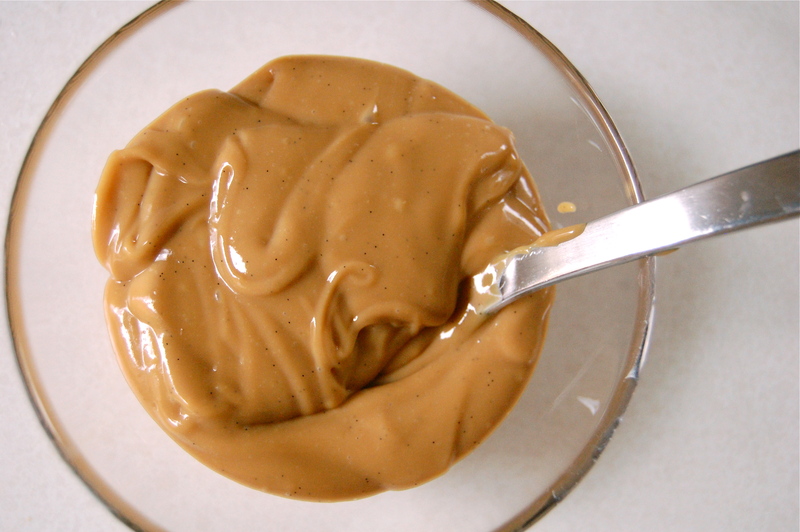 Not this one, here you actually MAKE a caramel sauce and then blend that into a brown sugar and milk mixture. And the depth of flavor was so awesome! And vanilla bean, I am such a fan of real vanilla beans in lieu of vanilla extract. Oh my lord, it was pure torture not drinking the entire batch. But I didn’t. I went back to the crusts, which by now had spent 30 minutes in the freezer to prep them for the oven. The instructions for this dough said to bake it for 12 minutes, but that was SO not long enough. I think I ended up baking these for 25 minutes to get a good brown. This was key, the caramelization of the brown sugar in the dough is what balanced out the oaty wheaty-ness. The recipe also said to bake them at 325, I’m thinking that they MUST have been talking about a convection oven, because that just doesn’t make sense. I ended up going with 350. I was a bit disappointed that once baked the shells developed not so tiny cracks on their bottoms. Since giant holes are not good for puddingy fillings, I painted the insides with melted chocolate. This created a nice seal and in the end made for a nice counterpoint in the overall flavor. And oh yes, we were some happy little campers when these puppies arrived on the table for dessert. While I will definitely adjust some of the technique for next time, I LOVED the flavor of these. The oaty flavor of the crust went so well with the sweetness of the filling. It sounds weird, but the combination reminded me of wheaties cereal. In a good way. Love it. 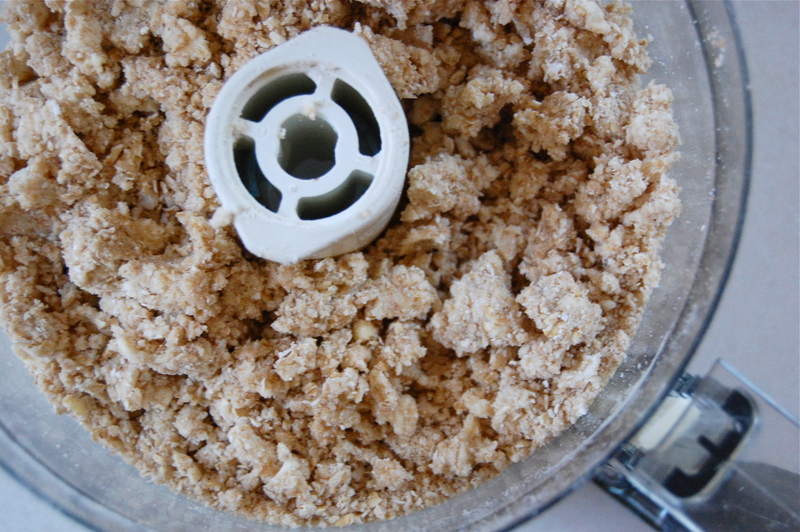 – Put the flours, brown sugar, and salt in a food processor and pulse until combined. Add half of the butter and pulse until the butter pieces are small and the dough looks crumbly, like coarse sand. Add the rolled oats and the rest of the butter in and pulse until the butter is mixed in, but still in decent sized chunks. – Add the milk and pulse for a few seconds. Add a tad more milk if the dough is still dry. – Scoop the dough out of the food processor and form it into a large disk. Wrap tightly in plastic and refrigerate for at least 1 hour. – Dust a work surface with flour. Unwrap the disk of chilled dough and put it directly on the work surface. Cut the dough into eight equal pieces, about 2 1/2 ounces each, and gently shape each piece into a smooth disk. The dough will be sticky. Make sure to turn the dough over as needed and keep the working surface floured. Put the dough disks in the refrigerator for 10 minutes. – Using a rolling pin, roll each dough ball into a 6-inch round just over 1/8-inch thick. Place a round over a 4-inch tart pan and very gently press the dough into the pan. Trim off the excess. Repeat with the remaining dough rounds. 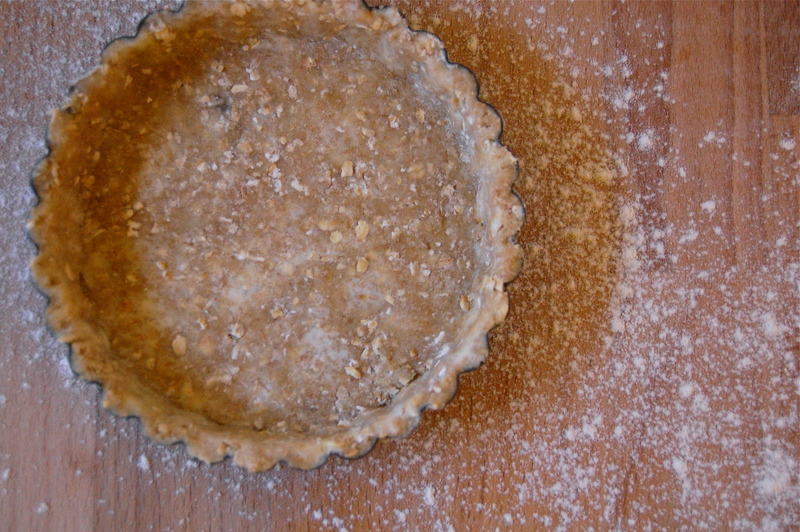 Use any excess dough trimmings to make a ninth tart shell or freeze for another time. – Put the tart pans in the freezer for 30 minutes. – Remove the tarts from the freezer, then arrange on a baking sheet and gently prick the dough with a fork. – Bake on the baking sheet until golden brown, about 25 minutes, rotating the baking sheet halfway through baking time. Start checking for doneness after 20 minutes. – Transfer the tart pans to wire racks and let cool completely. 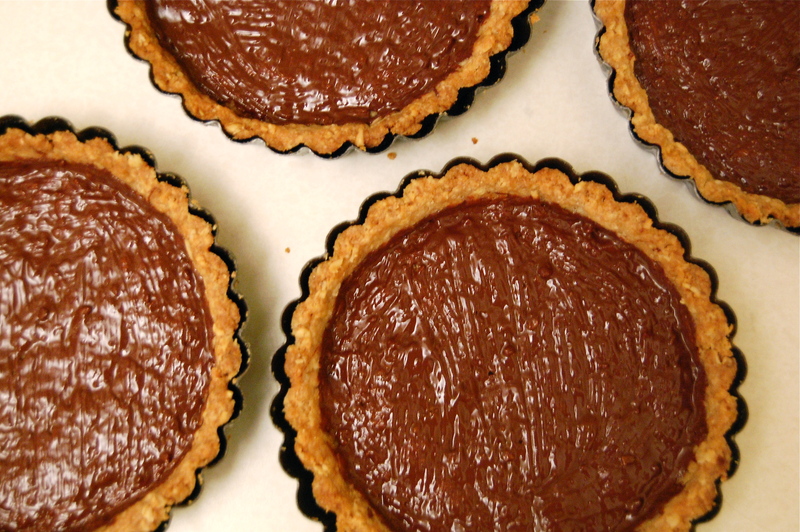 – If there are large cracks in the shells you can paint them with melted chocolate to seal the crust. – Put the egg yolks in a large heat proof bowl and set aside. – In a small saucepan, combine the granulated sugar, and ¼ cup water and stir gently with a heatproof spatula. Brush down the sides of the pan to melt any loose sugar crystals. Cook over medium heat until the sugar is dissolved, then increase the heat to medium-high heat and cook until the mixture begins to turn dark amber color. Swirl the pan, if necessary, to create an even color, but do not stir. Remove from heat and use the heatproof spatula to stir in the cream. Pour the caramel into small bowl. Set aside. 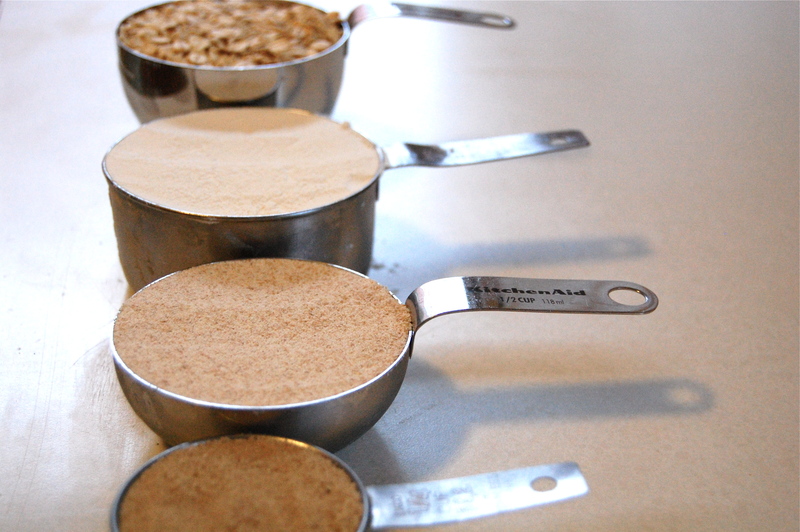 – In another small saucepan, combine the brown sugar, cornstarch, and salt. Stir in the milk and whisk to combine. – Add the seeds from the vanilla bean and the vanilla bean pod. Cook over medium-high heat, whisking occasionally, until the mixture comes to a boil. Remove from heat and add the caramel. Whisk together until combined, then slowly pour one third of the mixture over the eggs, whisking continually. Keep whisking the egg mixture and add another third of the hot milk mixture. Transfer the egg mixture back to the saucepan with the milk minute and, whisking the whole time, bring to a boil over medium-high heat. Boil for 3-4 minutes, or until very thick and a bit darker in color. -Remove from the heat and whisk vigorously for about 1 minute to cool the pudding slightly. Let the pudding sit for about 15 minutes. – Now that the pudding has cooled a tad, add the butter. This will keep the butter from losing it’s emulsion as it melts. – Chill the pudding in the fridge for an hour, to thicken it. Stir every 10 minutes or so to release the heat. – Whisk the pudding one more time until smooth. Divide the pudding equally among the tart shells and put them in the refrigerator for about 2 hours before serving. When ready to serve, garnish with some chantilly cream and chocolate shavings. Excellent ideas on making that recipe work. I see you had to tweak several things along the way, very smart! I’d love to try it again sometime–like you, I thought the whole thing sounded so fabulously earthy. And that Peanut Pie a few posts back? OMIGOD. Glad you found me in the blogosphere and I that I was able to click to you–great work! i have baked quite a few “treats” from the red hook boys book…my fav is their lemon, lemon loaf &… their banana espresso cc muffins are super yum! 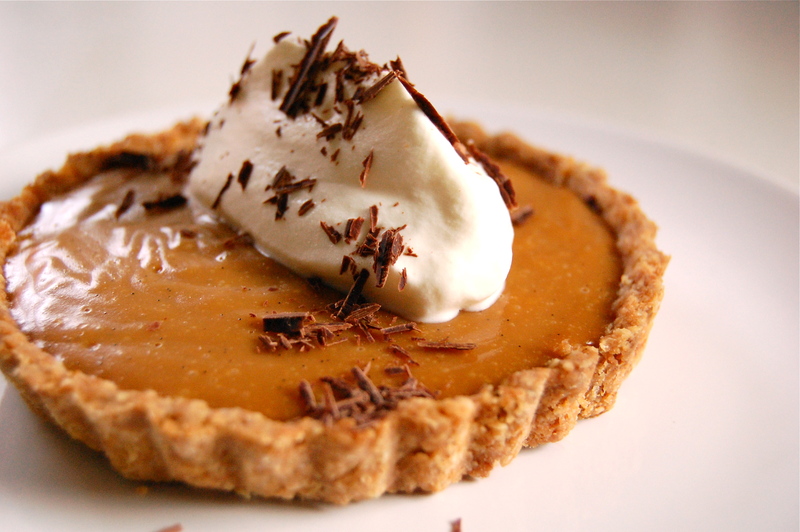 i am going to try these butterscotch tarts & take into account your tweaks…which i found most helpful. wishing you & those you hold dear a wonderful & joyous 2010! Delancey is fantastic! I truly think I have the best job in the world (for me). Very happy about the holiday closure, we’re all kinda tired, and I just got here! Happy Holidays to you too! Wow they sound sooo good! Brandi, it’s funny to find this post (I’m reading your blog for the first time), because after loving the lemon budino at Delancey, I was thinking, “I’d love to taste what the person who made this could do with butterscotch pudding…” Butterscotch pudding in jars with oatmeal shortbread on the side? I’d be there.